“Mi Vida Loca” (my crazy life) was a country song I used to like. Who knows why? I may have thought that song was about my life, but at 16, with no husband or children, I really had no clue back then what craziness was all about. Take today for example. **Warning: Difficult and traumatic story follows, but everything has turned out OK–praise God!! We returned from Red Gate on Friday, had a busy, but pretty normal Saturday, followed by a fairly restful Sunday. This morning (Monday), S left for work as usual, and I prepared for a day of catching up on bills and other miscellaneous paperwork that needed to be done. Around 8:30, my twice-weekly house-helper showed up. Everything was going pretty smoothly, until about 11. I was downstairs working on some bills, and my assistant was upstairs making up a bed in the boys’ room. R and A were upstairs playing. I heard the common pitter-patter of A’s little feet running across the living room, and then heard the sadly all-too-familiar “BOOM!” of him crash into something and fall down. Normally, I might hear him cry, verbally ask if he is OK, but rarely is anything serious enough for me to even get up. You have to understand that his clumsiness is a daily issue for us because of his as-yet undiagnosed neurological issues. In this case, however, I heard the most blood-curdling scream I have ever heard from one of my children and I immediately bolted up the stairs. At the same time, my assistant came running out of the bedroom, and reached him first. I was looking over my shoulder at A on the upstairs area above the stairs, as my assistant squatted to check on him. For the first couple of seconds (probably long enough for me to go up 4 steps at a run), he was holding his stomach and screaming a horrible scream. My first thought was that he broke something. Then, at that moment, his eyes rolled back in his head, his entire body went stiff, and he rared backwards–thankfully into her arms. I doubled my speed, got to him, and quickly took note of his symptoms as my past first-responder training kicked in. I knew he was having a pretty good seizure, then I saw his face changing color as I realized he wasn’t breathing. I told my helper to go call 911 and get the ambulance on its way. Probably 30 seconds had elapsed at that point. She got the dispatcher on the line, but because she was on the phone in another room, I was yelling his symptoms to her so she could relay the info to the dispatcher. After seizing for about 30-45 seconds (hard to say since time totally stops when it’s YOUR child! 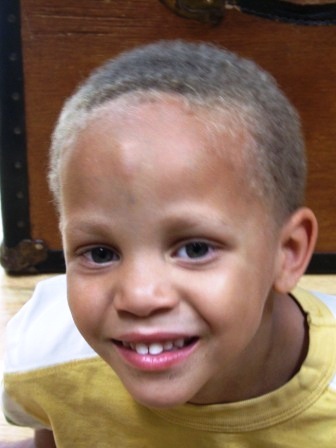 ), his lips and gums were totally a death-colored ashy white. It was awful, and I began seriously fearing I was watching my son die in my arms. I cannot possibly describe that feeling, and I wouldn’t wish it on anyone. Then, A’s eyes closed, his body went totally limp, and he was clearly unconscious. I still couldn’t see a visible injury, and begin checking, but at the same time, I noticed he started to breath again–albeit shallow and irregular. Slowly, though, color began to return to his face so I hoped the worst was over. He then began to come to, started whimpering and moaning, and tried to sit up a bit. At that point, my helper was having some difficulty answering dispatcher questions. So, with the worst over, I picked A up and took him into the other room, where I laid him on a table and began to talk to the dispatcher over a speaker-phone. Although conscious, it was still clear that A was out of it and not right. He started to complain that his stomach hurt (likely nausea from the head trauma). As the dispatcher kept us on the line, I knew we would be headed to the hospital, so I asked my helper to take my place by A while I gathered my things (purse for my own diabetes medical supplies and shoes) for the hospital. I returned, and had my helper go outside to meet the medics. After answering their questions and getting them up to speed, they began to prep A for the ambulance ride. I quickly attempted to call S at work, but of course he was not in his office today. By the time I finished, the medics were strapping A into the gurney in the ambulance, so I jumped in and away we went. My helper was left in charge of R, while my other 3 children “happened” to be playing at the neighbors. As we drove away, I saw their little faces standing along the neighbor’s driveway, clearly worried for their brother. We arrived at the hospital with A conscious, but still very quiet and not quite normal. I followed the medics into the hospital, to find an entire pediatric trauma team of 10-12 people waiting for us. I was kept in the hallway, as A was transferred to the triage gurney, stripped down, hooked up to monitors, and examined. By this point, his face had begun to show signs of his injury, and he had a clear bruise below and up to his temple where he hit (we believe the corner of a bookshelf he was running past). 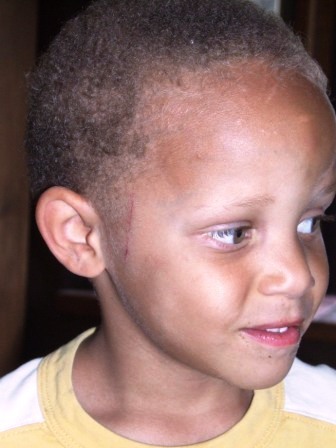 That’s not a scratch on the side of his face…it’s the linear bruise from his head hitting the sharp corner of the bookshelf. Once they were comfortable with his vitals, they took him away to do a CT scan and check for brain bleeds or other unseen trauma. In the mean time, a hospital liason came over to ask me who she needed to call. I explained to her that my husband was at the flight line that day, totally clueless about all this, and I needed to inform him so he could either come to the hospital or go get our other children. I told her who to contact on the base to get the info to him. She then essentially disappeared. Now, I will say, the good news here is that they felt A was OK, having concluded he suffered an “impact seizure” and minor concussion, and released him after several hours of monitoring. However, when the doc walked in and told me to not let him hit his head for 2 weeks so his brain could heal from the concussion, I just looked at him and shook my head. I had already told him about A’s neurological problems with coordination and clumsiness, and he had gone over the scars all over A’s head that proved it. He kind of laughed and jokingly said, “Can you make him wear a helmet?” After further thought, though, we agreed that was the only way to protect A. Our kind nurse went and found a brand-new, perfectly-sized bike helmet the hospital just “happened” to have on hand, and gave it to us. Now that you know everything turned out OK, I have to tell you the not-so-traumatic parts of the story, simply because I like to be detailed just because it’s the way my brain works. After arriving at the E.R., I did experience a slight moment of irritation as the doctor, following protocol, began questioning me about A’s past injuries. His little body is covered in bruises and scars, and after my experience with foster children, I am well aware of the importance of having a witness to such injuries. I just praised God right there for always providing a witness, as well as allowing us a record of having closely worked with specialists over the last 6 months! Some people joke that their kid is a klutz or prone to injury, but mine truly is! Just a few of A’s scars, and current scrapes, dings, and blisters, with most of the ones on his knee being from falls on the gravel while at Red Gate. When we first arrived at the ER, some of the nurses initially assumed the purple goose-egg on A’s forehead was the injury we were dealing with. I had to explain that it was from him running into a livestock gate while at Red Gate last week. So, I was sitting in the triage E.R. with A, and connected to our room was another room whose only entrance was through our room. By the sounds of things, there was “complainer” type of person who was clearly driving the nursing staff crazy with his constant complaints. For hours, I sat there, listening to him moan, yell for help, ask for morphine, and then complain about something else. I have no idea what his story was, but the nurses were obviously not making him a priority. A would periodically ask about the “noises” coming from that room, and I tried my best to tactfully explain that somebody had an “ow-y” in there. At one point, we were sitting there listening to the pitiful moans from the other room, and our nurse was filling out some paperwork by A’s bed. Suddenly, we heard a scream in the hallway, looked up, and saw a nurse go running past the door. Then another couple of nurses went yelling down the hall, though we couldn’t understand what they were yelling. Next, a police offer went flying down the hall yelling something like “Stop NOW!” Within 1/2 second, 3 more officers, followed by doctors and nurses went running past, everyone yelling, but we couldn’t tell what. Our nurse and I looked at each other, and she casually walked over and pulled the curtain shut, while I envisioned a lunatic, gun-wielding, criminal walking into our room. I never did figure out what happened, but finally heard something about a run-away patient–whatever that means. Thinking our day was winding down, the doctor walked in to discharge us. The nurse followed to have us sign papers, and I explained that we were stranded a good 30 minutes from home, and I REALLY needed to reach my husband, who still knew nothing of the morning’s events. I asked if the liason that had originally helped us had reached him, only to discover that other traumas had arrived and she was too busy with them to help us. We figured there was still time, though, as A was still hooked up to all the monitors, so she let me borrow her phone to make a few calls while she continued her duties. Suddenly, the nurse hastily walked in, quickly started unplugging A, asked me to help by removing his cuff and several sensors attached to his chest, and finally apologetically explained that a severe trauma was headed in and they needed our bed like NOW! With wires still attached, she had me pick up poor A, still shirtless and totally confused, and briskly walked us down the hall. She then apologized that she couldn’t lead us, but tells me to follow signs to the “triage waiting room” and mentions I can use the phone in there. I pointed out the wires still attached to A, and she quickly removed them. I followed the signs, only to find myself in the main lobby of the E.R. Amidst all the sick and injured people in the waiting room, I found a chair, set A down, and began dressing him and trying to recoup. Finally, I walked over to the phone, still attempting to reach S. No luck. I knew there had to be a way to reach him, if I could just reach the flight line. Yet, no one I called could find a number for the office there. I turned around and found several active duty members had entered the waiting room, so I went and asked them, hoping they could point me in a direction. One young guy piped up and explained that I could call the Red Cross, who would contact the base command post, who could then notify S that we were at the hospital. I then found a sympathetic nurse to help me get the Red Cross number, called, and was told that I no longer had an emergency (which was true) and so they couldn’t help. Four hours and many adventures after first attempting to contact my husband, and almost at wit’s end, I explained my situation and asked if she could at least offer a phone number I could call, seeing as how I had no access to a computer or phone book. One nurse I spoke with had even suggested I call a taxi, but without a phone book, even that idea didn’t work for me. I guess she felt sorry for me, as she agreed to give me the number for the base command post. I called, only to be shockingly told that they had no contact info for the flight line! ARE YOU KIDDING ME?! You’re the command post! You’re supposed to have a way to contact every major office on base in the event of an emergency! I explained our situation, and he agreed to send a security detail over to the flight line. Finally, a message arrived to S to call our neighbor (the simplest message I could send), who then filled him in. 40 minutes later, S arrived to pick us up and see his son. We then went home, exhausted–him from his day, and me from the huge adrenaline rush (which, oh by the way, sent my blood sugars through the roof, which didn’t help any! ), and collected our other children from the neighbors. Oh, and remember the helmet A is supposed to wear. Well, realize A also has sensory issues, and is not crazy over things on his head. Knowing he would have to wear it later, I agreed he didn’t have to wear it for the car ride (since he was just sitting), and then when we got home, I would let him sit and watch a movie. We arrived home, I carefully helped A out of the van, I walked right behind him to make sure he walked into the house rather than run. We made it about 10 steps inside the door, A walked over to the computer to sit down and watch Netflix, and lo and behold, if he didn’t run his face (same side as his initial injury, of course) right into the corner of the chair! All we could do was shake our heads, and move on. That’s just life with A. Though the moment that movie ended, you can bet the helmet went on! Later, we enjoyed a simple family dinner followed by family worship time, during which we cherished our family and praised God for the blessings of the day. Yes, it was quite a day. Yet, as I sat in that ambulance, holding A’s hand on the long drive to the hospital, I realized how God had arranged everything. My helper was there that day–both to assist and to serve as a witness (which came in very handy when the doctor began questioning me about all A’s scars and past head injuries). JR, M, and N all “happened” to be at the neighbors playing, and therefore did not witness any of the actual trauma we experienced. They only saw the ambulance drive in, and were wise enough to stay at the neighbors and watch from a distance. The ambulance from our nearest station (which is often out on a call) “happened” to be available, meaning that even though we live 30 minutes out in the country, they arrived at our home within about 7 minutes of the fall itself. Then, unbeknownst to me until later, the other children had watched as the paramedics loaded A into the ambulance and me climb in. JR told M that they needed to pray for A–for whatever had happened. The father of the home overheard JR’s comment, invited all the children onto the porch, and led them in prayer together. 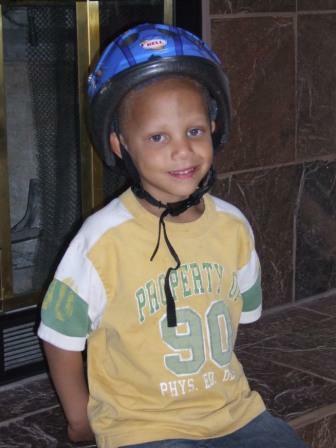 After I got back home, I realized that God had also allowed the hospital to have the exact-sized helmet for our needs (something the nurse said was unusual), and we were provided with wonderful neighbors willing to drop everything to take care of our children as their own. Thanks to my past first-responder training, despite my panic, my training kicked in and kept everything under control until the ambulance arrived to take over. I knew what to watch for, what was happening, and what information the dispatcher would need. And most of all, A was OK in the end. I’m sure I sprouted a few more gray hairs through this, but I am so thankful for a God that is so all-knowing and all-powerful that He provides in such a way that we never have to feel alone. Traumatic as the day was, I knew that my son was in God’s hands. There was truly a moment of panic where I thought I might be watching him die, and yet, despite the adrenaline rush flowing within me, I had a peace that everything would be OK. It was truly a good reminder that God never promises us an easy life or life without trauma, grief, and trials. What He does promise us is that He will ALWAYS be there to see us through it, no matter the outcome. When we feel totally alone, or at wit’s end, we can turn to Him for strength, courage, and endurance. He will uphold us at our weakest, and remind us of our strengths when we need it most. Because He is a great God, a dependable God, and a God that loves us more than we even love our own children. That is a blessing I cannot live without! Oh my what a day!! Glad A is ok!! Love that your kids first thought was to pray together that is awesome.. Dealing with “officials’ is so aggravating. There are so many people that run to the doctor for little bumps and scrapes that they seem to treat everyone like its no big deal.. God is so awesome like that though with the way things worked out.. He doesnt make everything flowers and Sunshine with nary a problem but when you have problems he makes our way smoother and is there for us to lean on the whole time…. Wow! What a story. Poor little guy. I got a little teary thinking about JR and M standing outside and JR suggesting they pray. So precious! I am praising God that A is ok and thankful that He met all your needs!